Five-star K.J. Henry has reached a milestone in his recruitment. The star defensive end has released his top ten. We made the cut for his final 10. Seems like we should make a twitter push (for the exposure as much as anything) - anyone got a better hashtag than #Henry2Charlotte? Even if he doesn’t come here, it is good that we are in the conversation with those other schools. clt says let’s hire the rest of his family. who cares? you can CHeat now. [quote=“cltniners, post:5, topic:30899”]clt says let’s hire the rest of his family. who cares? you can CHeat now. [/quote] #family. Let’s get him to verbal commit for the press. I’ve got no problem when he signs with Ohio State. He will be at the Spring Game Saturday evening. Who is lining up the co-eds? 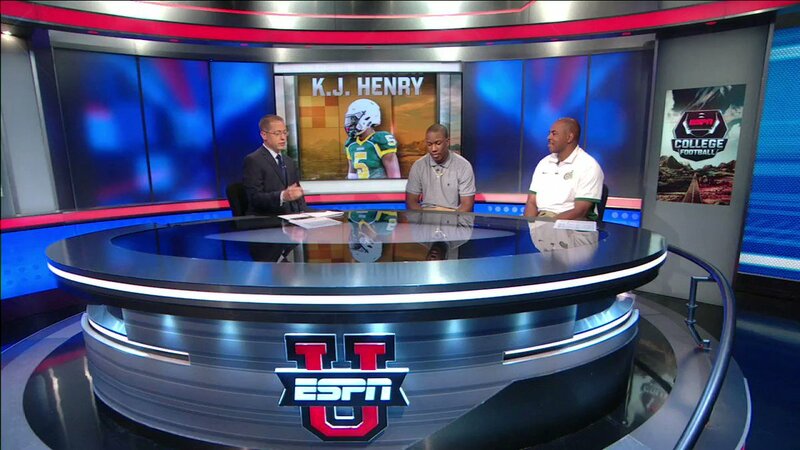 KJ and his dad (wearing a 49ers shirt) were on ESPNU yesterday. I can’t find the whole clip but here is a small piece. Really impressive kid off the field too. If he actually came here I’d be so ridiculously stoked about football. I thought I should post this while it is true. Nice company to be in. Does he have ties here? Why is this a possibility? I don’t wanna get my hopes up but this would be amazing. clt says to give this kid all of the cash and fake classes. CHeating is now ok.
His dad is a coach here. [quote=“Nugget, post:13, topic:30899”]I thought I should post this while it is true. Nice company to be in. I’m ok with a top 5 of Alabama, Ohio State, Georgia, South Carolina, and us. 3 traditional powers and then South Carolina and Georgia, good company to keep. Saw him play this past year, heck of an athlete. Very good basketball player too. If we were to sign him, do you think he could contribute to the basketball team too? An athlete playing 2 sports in college is seldom done now, but used to happen more often. Rusty LaRue at Wake Forest played and started in football, basketball, and baseball before he finished his college career.